Yugawara"- Little Kyoto" SUBPAGE | All Japan Kyoto Association"
Yugawara lies at the southwestern end of Kanagawa Prefecture facing Sagami Bay and is surrounded by the Hakone Gairin mountains on three sides. Blessed with natural beauty and a relatively mild climate, a number of poets in the Nara Period praised the attractions of Yugawara in their poems complied in the Man’yoshu anthology. Many of Yugawara’s hot springs are acclaimed for their curative properties on those convalescing from an illness and a large number of famous people have visited for this purpose. Day-trips include a hot spring visit, sea bathing at the beach, orange picking, hiking, and more – Yugawara welcomes visitors to fully enjoy the best attractions of the season throughout the year. During the Plum Festival at the Yugawara Plum Grove, red and white blossoms cover the entire mountain slope as if it were a carpet of plum flowers. A casual hot spring with an open-air bath accepting day-bathers. Fine art works by Seiho Takeuchi and other Japanese artists who loved Yugawara are exhibited. Great hiking destination all year round, particularly in early spring during plum blossom time. Flowers and plants introduced in the poems depicting Yugawara in the Man’yoshu (ancient anthology of poems compiled around the 8th century) are grown here. A unique hot foot bath combining Japanese hot spring and massage. A beautiful waterfall enshrining the Buddhist deity, Fudo Myo-o. About 4,000 plum trees cover the slopes of Mt. Makuyama. Lovely red and white blossoms cover the ground, forming a carpet of plum flowers. Many shops will be open during this season. An old story tells of local people from Yugawara bringing hot spring water to the shogun in the Edo period. 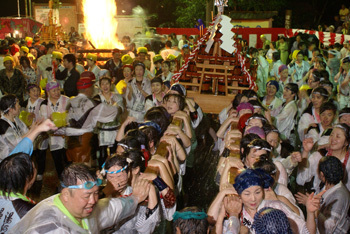 Based on this story, people throw hot water from the roadside onto the mikoshi portable shrine as it passes through the town. Some 10,000 fireflies flutter in the darkness with the sound of a stream nearby. 50,000 azalea bushes reach their full bloom all at once and create a magnificent view along the ocean in Sagami Bay. Shallow and quiet beach consists of black sand including iron sand. Recommended for families with small children. The origin of Yassa Festival dates back to the Kamakura period. Geiko and local people enjoy dancing together. 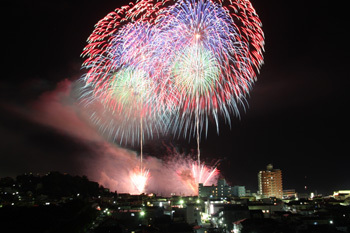 About 6,000 gorgeous fireworks will be launched into the summer night sky from the sea. The barrage of fireworks above the ocean’s surface is just outstanding. Fun and nostalgic summer festival that both children and adults can enjoy together. Terraced fields of Japanese oranges spread extensively along the slopes. Their surface is covered with white flowers in the early summer and ripening golden oranges follow. Ikemine Momiji-no Sato is a newly opened, must-visit tourist attraction in the Okuyugawara area which is famous for autumn colored leaves. There are about 540 maples trees growing in the garden welcoming visitors to an outstandingly colorful world. Using clay from Yugawara, fine ceramic works; cups, vases and tea ceremony utensils, are fired in the traditional climbing kiln set on the hill overlooking Sagami Bay. Many varieties of Japanese oranges, including Aoshima Mikan, are grown in the town. Handmade fresh juice is available for only a limited time in the year. Fresh seafood caught in the sea around Yugawara (horse mackerel, squid, etc.) are simply dried and become savory specialties. A traditional Japanese dumpling made using rice flower, millet, soybean powder and local spring water. Grated sesame, Tobanjan (spicy Chinese bean paste) and other spices complete this hot but tasty fried noodle dish. Each restaurant serves its original Tantan Yakisoba, so try one or more and enjoy the local taste of Yugawara.